I didn’t put ‘expensive’ in the list of cons because I don’t think it is expensive for what you get and the quality of the product. Sure it has a higher price than many epilators, even ones with extra attachments, but you get so much and its many functions are superb. The money you’d save on separate exfoliation mitts, razor blades and cleansing tools easily makes this system worth it. 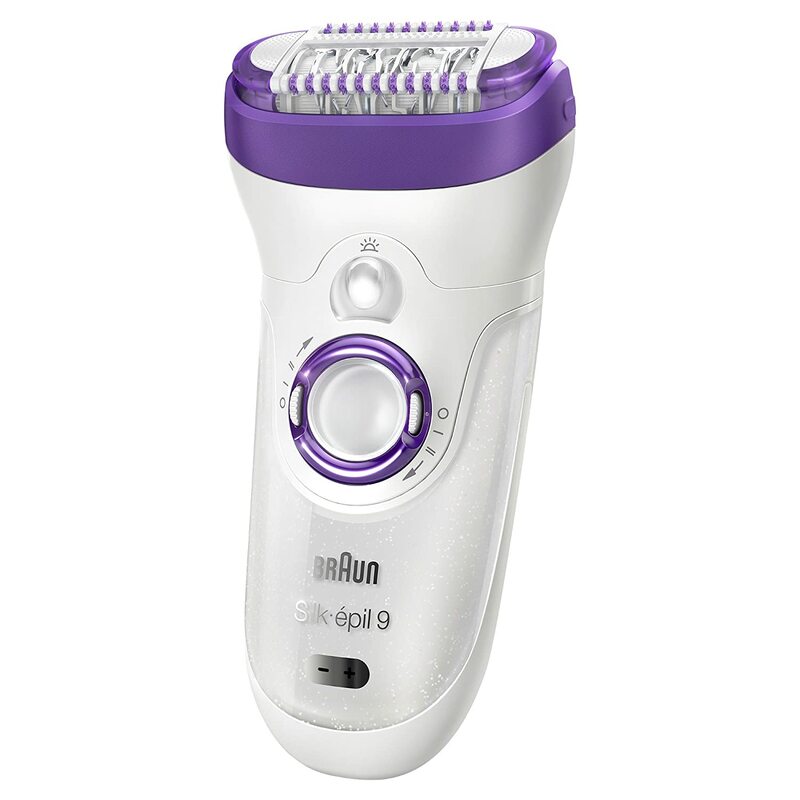 Braun’s technology and the in-shower usage make this epilator as pain free as epilators get these days and it’s really simple to use. There are no pointless accessories here, which is something I’m really impressed with and it’ll even work on sensitive areas without you throwing it down in horror. It’s charge time is a single hour and you get 40 minutes use out of it fully charged which is really fantastic. Overall…I’m pretty much in love. Walk into any department store or branch of Boots and you’ll see more Braun products than you can shake a stick at. They’re master of their industry and have been for going on a hundred years. While they have a slightly wearying habit of producing many almost identical products with one miniscule difference they are, nonetheless, a brand to be trusted. 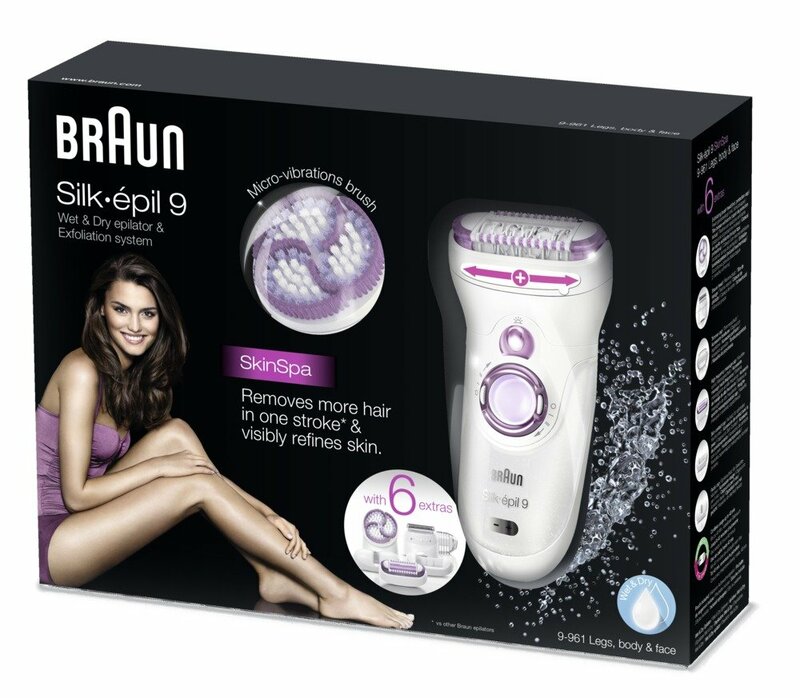 The Silk-Épil 9 series is the latest series from the personal appliance giant Braun and this SkinSpa set basically contains the motherload of accessories. For those who want a complete hair and body care system, keep reading. This is one of Braun’s most comprehensive packages and it’s bursting with their most up to date technology. As technology moves quickly it shouldn’t be all that surprising that the big guys in the epilation world have found ways of making it almost pain-free. But it still surprises me. Pleasantly. This is a cordless, rechargeable epilator that’s suited for dry use and wet use, making it a really useful shower companion and eradicating the pain that comes with dry use only epilators. It contains Braun’s awesome massaging pulse technology and showcases their new epilator head width at 40% wider than previous models. This actually makes a big difference with the length of time it takes to get hair-free skin. Braun have also developed something they call MicroGrip tweezer technology which is a fancy way of saying they’ve mastered the art of getting rid of hairs so small you can barely feel them to begin with. This is a fairly amazing step forward and something that speaks volumes for Braun’s innovative nature. The skin contact cap makes knees a pleasure to epilate and that’s pretty much never happened before. It can move with your contours with ease and no longer leaves you with tufts of hair in awkward places. Miraculously, this epilator can handle sensitive areas without much pain at all and that’s a huge selling point. It’s the first epilator that has really got me to this conclusion. The exfoliating brush head is an absolutely awesome addition to this package and works on any part of your body (but not your face) really effectively. It too can be used in the shower and should be a regular part of your routine to keep your skin looking bright and healthy. While exfoliation isn’t exactly a new thing, having an attachment really encourages you to actually use it and it’s a lot easy than manually exfoliating with a mitt. Laziness? Nah. The facial cleansing brush is also a big bonus and is softer than the exfoliating brush to keep the face cleansed but not stressed. The combination of all these accessories and the others such as the shaving head, high frequency massage head and the trimmer cap culminate to make a package that doesn’t leave you wanting. The worst thing about rechargeables is having to recharge them but Braun have got their charging time down to just 1 hour with 40 minutes of use before charging again. That’s as good as it gets and considering the epilation aspect of this tool is so fast and efficient, 40 minutes is a long time. I feel like I’ve praised this Silk-Epil 9 way too much but there really aren’t any downsides I can think of. Sure it’s on the expensive side but it’s an epilator, a shaver and an exfoliator all in one. What’s not to love? Oh wait, one thing; while the storage pouch is great, there’s no space for the attachments and they have to be stored separately. This seems like a bizarre thing to miss out when they’ve clearly tried so hard with the rest.